Content discussed here are things people might; 1) read in a brain MRI report, 2) discussion with a doctor during the review of a brain MRI, 3) experience a few days after a brain tumor treatment. Things here also include points doctors might want to know including availability and requirement of MRI safe shunts for patients with brain tumors. Blood Flow: As CSF circulates inside the blood-brain barrier between the brain and spine it helps regulate the consistent flow of blood for nerves, veins, and arteries. Giving: CSF helps filter nutrients to the brain. 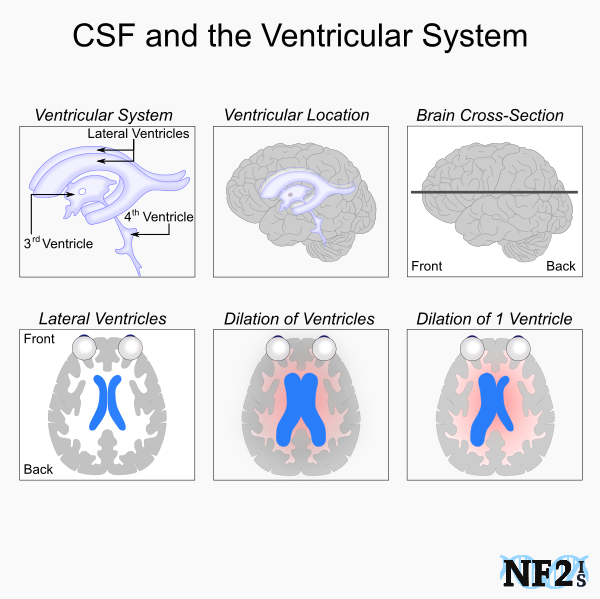 Protection: CSF is a protective barrier for the brain and spine that absorbs shock as the body moves or is moved. Tumor growth can cause issues with the necessary flow of Cerebrospinal Fluid (CSF) from the brain into the spine. There are two forms of Cerebrospinal-Fluid flow issues that might develop; Intracranial Pressure (Obstructive Hydrocephalus) and CSF Leak Intracranial Hypotension). There are different forms and potential reasons for intracranial pressure (hydrocephalus). For individuals with neurofibromatosis type 2 (NF2), the form of hydrocephalus to develop non-communicating, obstructive hydrocephalus; is an abnormal buildup of CSF in the cavities (ventricles) of the brain. The buildup is often caused by an obstruction of a tumor or multiple tumors which prevents proper fluid drainage. The fluid buildup can raise intracranial pressure inside the skull and result in brain matter compression. CSF needs to continuously flow from brain to spine and as tumor burden increases, where the flow stops can be fatal. There are warning signs that this is happening and different treatment options. Papilledema - Optic disc swelling that would be seen by an exam done by a Neuro-Ophthalmologist. Head pressure following; coughing, sneezing, or exertion. Diamox (Acetazolamide) can be used to delay surgical intervention. 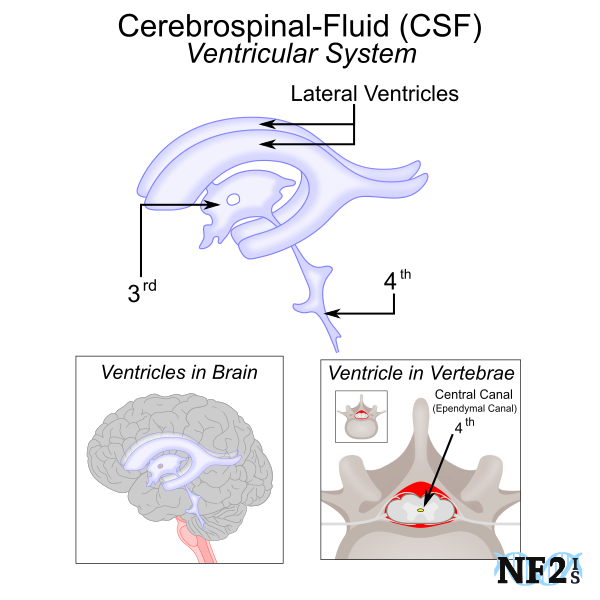 CSF is a liquid barrier between the brain and skull, as well as a barrier between the spinal cord and vertebrae. During brain and spine surgery, when tumors are removed, the barrier needs to be opened for the operation and closed when completed. Despite steps taken to close this barrier, if swelling occurs after surgery, the surgery entry point can be easily reopened. This would change the path of normal CSF flow, allowing this vital system fluid to escape. Intracranial hypotension (CSF Leak), is a result of escape of the fluid from the membrane that surrounds the brain and spinal cord. In addition to closing the entry point with surgical methods, newer additional techniques of brain surgery include using abdominal fat to be added in place of some of the tumor mass removed to prevent this from happening. Most commonly when a CSF Leak occurs it is within 10 days of brain surgery. Since many of the symptoms of a CSF leak are similar to after surgery issues. In many cases it is not noticed unless bacterial meningitis develops, but can also become evident if there are signs of a sinus issue. Sinus Drip - Overflow of CSF can force its way through the sinuses. Sinus Drip can also leak into the eyes, ear, or nose, but is uncommon. Minimal Leakage can heal from bed rest and an increase in fluids. Autologous Fat Grafting (free fat graft): Method used to help fill newly-created dead space, when done so with brain surgery helps guarantee closure of the dura to prevent CSF Leak. When done fat is typically used from the individual's abdomen. Found to be a better method than titanium mesh as mesh results in risk of infection. Synthetic options also possible alternatives, but are higher cost. Surgical Drains: Placement of drain during surgery to be removed after CSF stops filling the drain bag 24 or more hours after surgery. This is a recommended against treatment option unless a brain incision is of considerable size, example of from ear to ear. Other methods would be best used for smaller incisions. Dunn, Laurence T. "Raised intracranial pressure." Journal of Neurology, Neurosurgery & Psychiatry 73.suppl 1 (2002): i23-i27. Ackerman, Paul D., et al. "The use of abdominal free fat for volumetric augmentation and primary dural closure in supratentorial skull base surgery: managing the stigma of a temporal defect." Journal of neurological surgery. Part B, Skull base 73.2 (2012): 139. U.S. National Library of Medicine. National Institutes of Health. (May 2014). "Normal pressure hydrocephalus (NPH) - Hydrocephalus - idiopathic; Hydrocephalus - adult; Hydrocephalus - communicating; Extraventricular obstructive hydrocephalus." U.S. National Library of Medicine. National Institutes of Health. (May 2014). "CSF leak."